The oneness and diversity that lives within the person of God is one of the most wonderful paradoxes in all of The Bible. Three distinct aspects of Him are referenced throughout scripture. They are clearly aspects of one entity, yet are so unique unto themselves, we are better able to visualize three persons rather than one. But God who said, “Let Us make man in Our image,” is one inexplicably diverse being. The eternal and internal interaction that is taking place within the person of God reflects everything Jesus taught about community. Deference, servitude, respect and love exist as Father, Son and Spirit commune within themselves. That communion gives insight into the comprehensive provision of God for His children, (the Father’s watchfulness, Matthew 10; the Son’s intercession, Hebrews 7; the Spirit’s guidance, John 15-16; and intercession, Romans 8). For all we don’t understand, we do get a generous look at the depth of His love for humanity and the lavish attention focused on His children. There is no explaining the reality of the internal diversity of God. To say more would be to venture beyond a capacity to understand. There isn’t a shelf low enough that would allow humans to access more than a shadow of insight into the mystery of The Triune God. In the next few posts, I’m going to try to give language to what I’ve been learning about what it means to be invited into the presence of God, and to live from that connectedness. The umbrella over the forthcoming conversation is: Entering the Dialogue. The visual is that of four chairs, each facing the others. 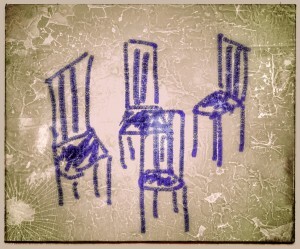 Three chairs are occupied by The Triune God and the fourth is reserved for me. Entering the Dialogue and occupying the fourth chair is simply coming into the company of Father, Son and Spirit, where a vibrant, active, eternal exchange is taking place. It’s a place of fellowship, council, and provision of every kind. It’s where I was designed to live and from that connectivity, experience the fullness of who God made me to be, and more importantly, to experience God Himself. I pray God would guide these posts and use them to open our understanding to the beauty of His invitation to draw into His company. I love the visual of the chairs and the theme of the invitation. I'm moved by that and look forward to God bringing more clarity into my mind and heart on this topic. You are onto something my friend - God is moving and stirring your heart and he continues to use you in my life. I can't wait to meditate on your next posts. love you. Anne, this is such a beautful visual of this "meeting in progress" that I, little old me, am invtited into. I'm struck with awe by the intimacy of this, overwhelmed by it's magnitude, and honored by the invitation. Thank you for speaking words, and a visual into this amazing truth. Love you! Anne, I am thrilled beyond that you are taking us on this journey with you. This rich illustration has given me new insight and a deeper understanding of what communing with God is meant to be and I know He will use this uniquely in the life of each reader. Love you, sister. Anne, Im looking forward to reading more of this in the days to come!! !